NorthJersey.com | Top 5 Kitchen Designs for Chefs – Design Your Lifestyle. 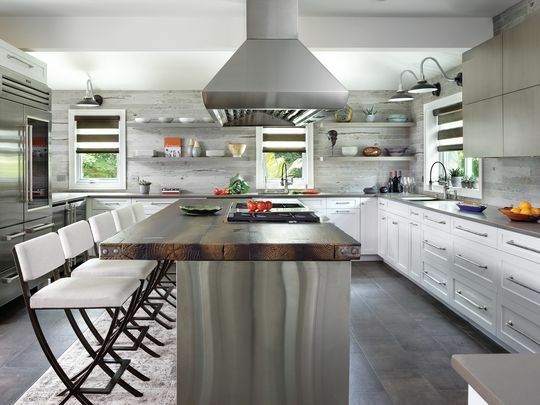 Laura Adams Stiansen of NorthJersey.com recently ranked the “Top 5 New Jersey Kitchens Designed for a Chef (or chef at heart)” – and we love her list! Laura’s list of featured designers is a high-class “Who’s Who” of kitchen designers and kitchen design firms. From Peter Salerno Inc. to Ulrich, Kitchen Kaboodle to Anthony Albert Studios and Kuche+Cucina, these design firms (and their kitchen designs) have left both professional chefs and enthusiastic, serious home cooks in awe. The contractors featured on these designs, in no order, are Kuche+Cucina, Anthony Vero, Ulrich, Jim Van Orden, and Ulrich. Laura Adams Stiansen’s list of kitchen designs piqued our interest due to its attention to detail and appeal to multiple types of consumers, chefs and families. Her featured kitchen designs include “For a growing family”, “for a rising culinary creator”, and “for the master chef”. Whether your family is growing from four to five or if your new hobby is creating innovative dishes with the ingredients you have on hand — having the right tools in your kitchen is important. Space, shelving and high-end appliances are all pieces that need to fit together to create the perfect kitchen. The designers of these world-class chef’s kitchen designs were happy to speak regarding their creations. “I feel it’s always best that we get involved before construction begins to be certain all the client’s wants and needs can be met,” Anthony Passanante of Anthony Albert Studios added. For more on these amazing kitchen designs created with chefs and avid cooks in mind, please check out the full article on NorthJersey.com!